Welcome to Alpha Gifts & Awards, where you can browse a huge selection of trophies and awards for all occasions online. From competition winners to achievement awards, we provide all of our trophies with the option of our professional engraving service so you can customise your trophy to say whatever you want! We use the latest engraving equipment to guarantee an outstanding finish, and we’re so confident you’ll love our trophies and awards that we offer a ‘no quibble’ satisfaction guarantee on all purchases. We are proud to supply a wide range of high quality awards and medals that boast the best prices available. From budget awards to solid silver trophy cups, our selection caters for all budgets and is sure to put a smile on anyone’s face! The high quality materials we use means that anyone presented with one of our awards will be proud to present it in their home – and not just for their achievement! Take a look at our range of awards, trophies and medals below. If you’d like personalised engraving this can be added after your trophy has been placed in the basket. 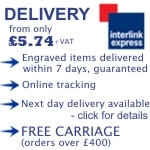 Delivery is guaranteed within 7 days, and if you would like more information please feel free to call our advice and order line on 0800 0355 277.